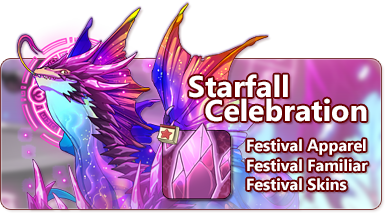 This month, all of dragonkind come together to celebrate the Starfall Celebration. 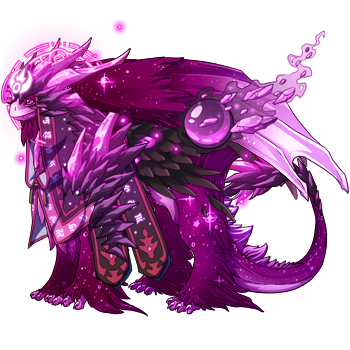 This festival celebrates the arcane dragonflight. Our most prized possessions, Magical Shards, can be found by using any gathering profession in the arcane territories this week. Neutral and arcane-aligned monsters also have a chance to rarely yield these items as drops in the Coliseum. They may be crafted at Baldwin's Bubbling Brew using alchemy reagents. Click here to read more about this update. A solidified chunk of pure magical energy, pulsating slowly. This can be traded at the Festive Favors shop during the Starfall Celebration. The Festive Favors holiday stall and Joxar's Spare Inventory is now open for the duration of the holiday and you may trade in Magical Shards and Prismatic Tokens for themed items! It will remain open until the holiday comes to a close on Sunday, September 30, at 06:00 server time. These deceitful harpies claim to be defectors of Talona, striking out to forge alliances with dragonkind. Little do many know that they are actually her most talented spies. For the duration of holiday, 12 (twelve) of these skins will be stocking in the Treasure Marketplace and 6 (six) of them can very rarely be gathered by digging in the arcane territory or by battling in the Coliseum. 2 (two) of these skins will be exclusively craftable in Baldwin's Bubbling Brew. Starfall Celebration 2018. (1/14) Designed by Electropunk. Starfall Celebration 2018. (4/14) Designed by notecardPasta. Starfall Celebration 2018. (5/14) Designed by AppleDad. Starfall Celebration 2018. (13/14) Designed by Saerino. Starfall Celebration 2018. (2/14) Designed by VivviViola. Starfall Celebration 2018. (8/14) Designed by Lokenosse. Starfall Celebration 2018. (7/14) Designed by hanhan. Starfall Celebration 2018. (14/14) Designed by Erithuet. Starfall Celebration 2018. (6/14) Designed by fouguri. Starfall Celebration 2018. (12/14) Designed by MasterK. Starfall Celebration 2018. (3/14) Designed by Intikam. Starfall Celebration 2018. (10/14) Designed by Snowkitsu. Starfall Celebration 2018. (11/14) Designed by shroudrat. Starfall Celebration 2018. (9/14) Designed by constellationxx.